Lumia 820: The Lumia 820 is will sport a 1.5GHz dual-core Snapdragon S4 and 1GB of RAM. That is the same as Nokia's new flagship device, the Lumia 920, but the 820 ships with a 4.3-inch WVGA Clear Black OLED display, with 800 x 480 resolution.The device ships with only 8GB of internal storage, and an 8MP rear-facing camera with Carl Zeiss optics and a dual LED flash, along with 1080p HD video capture at 30fps. The front-facing camera is VGA resolution. 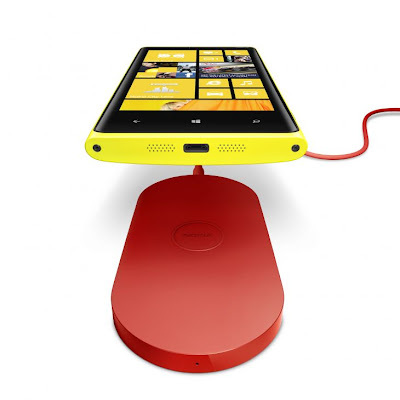 The Lumia 820 has a removable back which allows you to change the color of the phone. It is also possible to buy wireless-charging capable cases. The Nokia Lumia 820 comes in red, yellow, grey, cyan, purple, white and black, and comes with a 1650mAh battery. Remember, wireless charging is an option, not standard. Lumia 920: Nokia's new flagship device, the 920 comes with the same 1.5GHz dual-core Snapdragon S4 and 1GB of RAM as the 820, but that's when things change. The device comes with a 4.5-inch high definition WXGA 1,280 x 768 4.5-inch display with Nokia's new Pure Motion HD+ technology and Clear Black. The Lumia 920 will come with a 8.7MP rear-facing camera with what Nokia called its "PureView advanced optical imaging stabilization;" notice the difference between the 41MP in the PureView 808 and you'll see Nokia is extending the PureView brand to encompass its mobile products. The camera also includes Carl Zeiss optics and 1080p HD video capture at 30fps. On the front-facing side, the 920 sports a 1.2MP camera. Wireless charging is built-in, unlike on the 820, and Nokia includes a 2000mAh battery, its biggest ever. The 920 will also come with 32GB of RAM but no microSD card support, according to Nokia. You'll have less selection in terms of color, though (not a deal breaker, is it?). The Nokia Lumia 920 comes in yellow, red, grey, white and black. Software: Software-wise, both phones will naturally sport Windows Phone 8. There will be a number of extras for these Nokia phones, including an exclusive Angry Birds Roost app. Don't get too excited, though. Angry Birds Roost is just a "hub" for all things Angry Birds. Nokia didn't announce some important information. Typical of many of these introductions (sans Apple, of course), Nokia didn't mention a ship date or price. All the Espoo, Finland company said was that it expects to start shipping in select markets later in the year, and that it would announce pricing and specific roll-out dates country-by-country when sales are slated to begin.